Exquisite Wildewood home on secluded, water front lot boasting over 130 feet of water frontage! 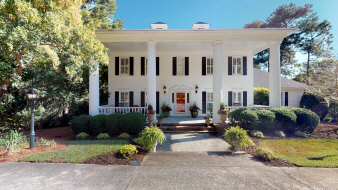 This gorgeous southern Colonial greets you with an expansive front porch. 5 Bedrooms, 4 1/2 baths and a full basement that would make a wonderful in­law suite with separate access, full bath, wet bar, weight room, den, billiards area, laundry room and space to add kitchenette. Chef style Kitchen with all the bells and whistles to include Sub Zero refrigerator, expansive island with Wolf Induction range, double ovens, drawer style microwave, subway tile backsplash and ice maker; beautiful Eat­in dining area with built­ins and incredible water views. Kitchen opens to fantastic entertaining deck with covered porch; 2 potential master suites with one bedroom on main level with full bath and 2 walk­in closets; Formal Living and Dining Rooms; Great Room open to Kitchen with wood burning fireplace and surround sound and more. Must See this BEAUTIFUL home!